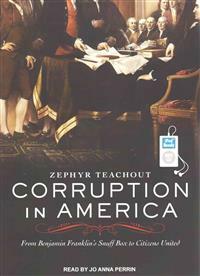 This is the fourth of four blog posts on Zephyr Teachout's excellent new book, Corruption in America: From Benjamin Franklin's Snuff Box to Citizens United (Harvard Univ. Press). Teachout talks about the difference in the origins of bribery and extortion statutes, the first coming out of judicial rules (bribing judges), the second coming out of rules governing appointed or employed officials who use their position to require money from those the official is supposed to serve for free. It's interesting that one rarely hears the word "extortion" in a government context anymore. The term "pay to play" covers one form of extortion, but it certainly seems less judgmental. Pay to play, because much of it is legal and it is done by elected officials rather than employees, is frowned upon, but often considered ordinary business, unlike bribery or extortion. And yet, Teachout notes, extortion was, at first, more likely to be criminalized "perhaps because the power dynamic of an official extorting a citizen was more dangerous than a citizen bribing an official." But Teachout says that from the mid-18th century "the elements of bribery and extortion were increasingly fused." Most seriously, Teachout notes that, in some jurisdictions, "law, practice, and culture were disconnected, each from the other." And for a long time no one was convicted under bribery laws. "They resigned, fled the country, or simply soldiered on, but criminal bribery laws played more of a symbolic role." Teachout talks a lot about judicial decisions regarding whether laws passed by legislators who have been bribed may or should be voided. Most judges appear to have said that it is impossible to know the true motives behind an act of legislation. But Teachout and I agree with the view of Justice Freeman of the Tennessee Supreme Court in the case Lynn v. Polk, 76 Tenn. 121 (1881). Justice Freeman saw bribery as fundamentally a process failure, so that a law passed through bribery is much like a law passed due to a miscount of votes. Considering that a private contract based on fraud or bribery is void, why shouldn't a public act be similarly void? Justice Freeman also noted that a bribed legislator is acting not as a representative, but as an agent of whoever bribed him. Starting in the mid-18th century, political campaigns became the norm, and candidates would promise jobs to supporters, who would pay "assessments" from their income to political parties to pay for the campaigns. Families would tie themselves to parties to get family members jobs. Personal relationships were central to winning and governing, which was exactly what the Founders did not want. Teachout tells a story I hadn't known about. James Garfield was elected president as an anti-corruption reformer who proposed civil service reform, and in July 1881 he was shot by a supporter who resented not being given a job in return for his campaign work. This must be the low point of the patronage system, at least at the federal level. The result, in part, was the Pendleton Act, which created merit-based hiring and made it harder to offer jobs to prospective campaign workers. Civil service reform spread through the states over the following decades. Moral of the story: you can kill the reformer, but not the reforms. There is another moral to the story, however. "[W]ith no government employees to fund the cost, candidates turned elsewhere — to newspaper owners, wealthy individuals, and corporations with an interest in legislation." Parties remained in control of campaigns, using all sorts of schemes, such as special party ballots and purchased votes, which have been illegal for so long, they are largely forgotten. Partial reforms lead to clever forms of ethical misconduct. No trustee has more sacred duties than a public official and any scheme to obtain an advantage by corrupting such an one must in the federal law be considered a scheme to defraud. The issue was not harm to the city of New Orleans, but the faithlessness of the city official and people's attempts to undermine the official's "sacred" (I prefer "fiduciary") duties. This is the basis for "honest services fraud," which has recently been limited to bribery (see my blog post on the 2010 Skilling decision). Teachout has an interesting argument against using the language of "fiduciary duties." She says that it "translates emotional complaints into legal forms, whereas corruption law often works the other way — the charge that something is corrupt is highly emotional, but the way the charge works in law is through the violation of a campaign finance law or a conflict-of-interest law. When states passed sprawling but unenforced statutes in the nineteenth century, their broad condemnation played an important role in the public's description of how it wanted public officials and citizens to act. The anticorruption laws expressed a vision of undesirable human behavior … The ability to call a public official corrupt arguably reveals the authority of the citizen. It suggests that she has the right to claim generalized attention instead of attention toward private interests." I think that "fiduciary duties" is a good description of what citizens should expect from government officials. It's a way of focusing on the right to "generalized attention" that Teachout refers to. Without this sort of focus, charges of corruption are all over the place and more general ("all politicans are corrupt"), and they make officials have disdain for citizens who, from their point of view, have no idea how government works. Teachout continues with a lot of material, based mostly on federal court decisions, involving criminal enforcement of corruption laws. Unfortunately, she does not consider the alternative of government ethics programs, with laws that do not require shows of "corrupt intent," which provide training, advice, and disclosure, and which are much cheaper, faster, and independent, at least if they follow best practices. Her many quotations from postwar Supreme Court cases shows how poor a basis "corruption" is for making determinations about campaign finance laws. The definitions of "corrupt" have kept changing, until they finally were narrowed to a point where the term is meaningless. It makes one wonder if "corruption" should not have been tossed aside centuries ago. But since it wasn't, this book is necessary. But what is most relevant to government ethics is how little attention the courts have paid to conflicts of interest in comparison with corruption. Teachout takes an interesting look at the U. S. Supreme Court's Kelo v. New London decision (545 U.S. 469 (2005)), which involved a public taking of land by a city government for a private commercial development. The plaintiffs insisted that corruption was "the primary factor driving the abuse of eminent domain for the private benefit" in this matter. This led the majority to hold that a city would not be allowed to "take property under the mere pretext of a public purpose, when its actual purpose was to bestow a private benefit.' As Teachout notes, "this language advocates for . . . a close examination of the reasons that a legislative body passed something, an examination of motive." But in a government ethics context, legislators' motives are never considered. The dissent of Justice O'Connor argued that the "public use" provision of the Takings Clause was an anti-corruption provision, with an emphasis on political inequality: "The beneficiaries are likely to be those citizens with disproportionate influence and power in the political process, including large corporations and development firms." But large businesses are involved in almost every large development for which takings of land are made by the government.